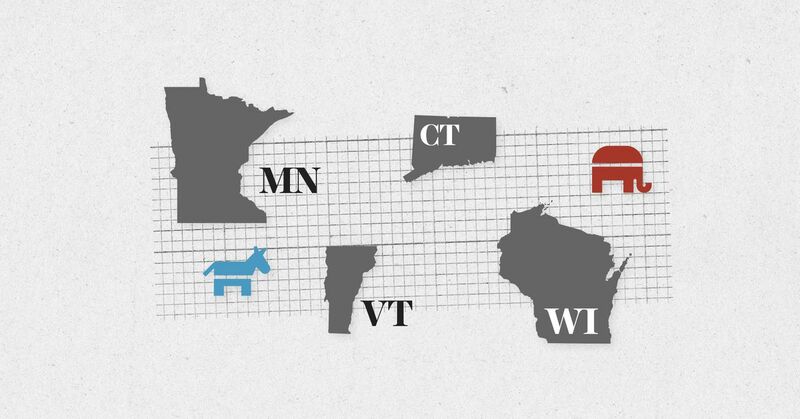 Voters head to the polls in Wisconsin, Minnesota, Connecticut, and Vermont to pick their general election candidates. The August 14 primary elections will set up several key pickup opportunities for Democrats in the 2018 midterms: Come November, they could finally unseat Republican Gov. Scott Walker in Wisconsin and they could also win a handful of House districts in the Badger State and in Minnesota in their quest for 24 seats and a House majority. The story of the 2018 midterm elections has been Democrats looking to regain ground in Congress, in governors’ mansions, and in state legislatures across the country, by riding a wave of historic backlash against President Donald Trump. But the states voting on Tuesday — which also include Connecticut and Vermont — will present Republicans with a few rare opportunities to win offices from Democrats. The Minnesota governor’s race is wide open, and election forecasters think it’s a toss-up. The GOP could win a few House seats in Minnesota in historically conservative districts that have been sending Democrats to Congress for years. Republicans also have a chance to win the Connecticut governor’s election, with an unpopular outgoing Democratic governor dragging down the party. Here is every August 14 primary election you should know about, briefly explained. Wisconsin Gov. Scott Walker and Foxconn chair Terry Gou arrive for a groundbreaking for the Foxconn plant in in Mt. Pleasant, Wisconsin, on June 28, 2018.Brian Cassella/Chicago Tribune/TNS via Getty ImagesWho is the Republican? Incumbent Gov. Scott Walker is running for his third term. If Walker wins reelection in November, it will be the fourth time the state has elected him to the governor’s mansion — and he’s only running for his third term. Walker, who was first elected in 2010, is probably best known for being a conservative union buster, stripping public employee unions of their collective bargaining rights in 2011. The fallout was enough for Democrats to force a recall election. But he won that — and reelection. Who are the Democrats? More than eight Democrats have filed to run in Wisconsin’s gubernatorial primary. Democrat Tony Evers, the state’s public education chief, is in the lead, but polling has been scarce, and several other candidates have pulled in notable endorsements and fundraising. Mahlon Mitchell, the president of the Professional Fire Fighters Association, has the support of California Sen. Kamala Harris, and Kelda Helen Roys, a former state Assembly member, has the backing of New York’s Sen. Kirsten Gillibrand (and Wisconsin’s most famed indie band, Bon Iver). State Sen. Kathleen Vinehout (who has run in a Democratic gubernatorial primary before) and political activist Mike McCabe have also gotten progressive support. Wisconsin state Superintendent Tony Evers speaks about his lifetime of experience in education, and his three statewide wins as leader of Wisconsin schools, as he prepares to challenge Republican Gov. Scott Walker in Madison on August 22, 2017.Scott Bauer/APWhat’s the story? Walker is one of the Democratic Party’s biggest white whales anywhere in the country. Evers is in the best position going into the primary, having won election since 2009 as Wisconsin’s superintendent of public instruction. It will be a fast and heated race to the general election after Tuesday’s primary. Walker’s failed 2016 presidential campaign tanked his popularity in the state, something he has been campaigning hard to fix. Still, polls show him closer to a possible Democrat challenger than in any of his past races. Who is the Democrat? Sen. Tammy Baldwin, first elected in 2012. It is her first reelection, and Republican donors really want to topple her. She has positioned herself as a defender of Obamacare’s preexisting condition protections. Sen. Tammy Baldwin (D-WI) take her seat for a Senate Health, Education, Labor, and Pensions Committee hearing on September 12, 2017.Bill Clark/CQ Roll CallWho are the Republicans? It’s been a fierce primary between state Sen. Leah Vukmir and former veteran/ex-Democrat Kevin Nicholson. They’ve climbed over each other to swing to the right and embrace Trump. Nicholson’s history as a Democrat has been used against him while he has attacked Vukmir’s initial reticence to embrace Trump. What’s the story? Baldwin was initially thought to be pretty vulnerable — she isn’t particularly popular, and outside money has been pouring in against her — but she seems to be on pretty solid ground for her first reelection. The early polling has shown her leading both Vukmir and Nicholson by 10 points or more, and the vicious GOP primary could make it hard for Republicans to unite around their eventual candidate. As a result, election forecasters have moved the race into the Likely Democratic column. Who are the Democrats? Two Democrats — Randy Bryce, a populist ironworker and union organizer who goes by the nickname “Ironstache”; and Cathy Myers, a school board member and teacher — are in a bitter battle to clinch the chance to win House Speaker Paul Ryan’s seat in Congress. Randy Bryce (center) stands with local residents at a rally to call attention to gun violence in Paul Ryan’s hometown, Janesville, Wisconsin, on March 28, 2018.Scott Olson/Getty ImagesWho are the Republicans? Bryan Steil, a well-known local business executive with Ryan’s endorsement, is the favorite to win the Republican nomination. Also on the ballot: Self-described “pro-White Christian American candidate” and alt-right troll Paul Nehlen; Nick Polce, an Army Green Beret and first-time candidate; Jeremy Ryan, a pro-marijuana candidate whose campaign website features him taking bong rips; and Kevin Steen, a Christian business leader who has been endorsed by Pro-Life Wisconsin. What’s the story? Unseating Ryan has always been something of a pipe dream for Democrats. With his retirement, Democrats have a real chance to win the open seat. The Cook Political Report rates the race Lean Republican. Hillary Clinton lost the district by 11 points in 2016, and Barack Obama lost it by 5 in 2012. But Obama won the district by 3 points in 2008, and a surge in Democratic voters could catapult the party to a win. But Democrats are currently embroiled in a messy mudslinging match in the primary. Bryce gained a national platform after releasing a viral campaign ad in the summer of 2017, raking in donations and winning some high-profile endorsements, like Sen. Bernie Sanders. But he’s had media flubs and has faced questions over past arrests for marijuana use and a DUI, and his past failures to pay child support. Myers, who has won elected office in the area, has been actively attacking Bryce’s character and his lack of policy chops. It’s made for an ugly race — and one that could damage both candidates for the general. Steil, the Republican favorite, will undoubtedly have a lot of party resources behind him and doesn’t have any serious opponents in the primary. Who is the Republican? Rep. Glenn Grothman, a conservative first elected in 2014. He’s never lost an election in 24 years in elected office. Rep. Glenn Grothman (R-WI) speaks to a constituent outside the Utica Volunteer Fire Department in Fisk, Wisconsin, after a town hall meeting on January 25, 2017.Mike DeBonis/The Washington Post via Getty ImagesWho are the Democrats? Dan Kohl. He’s been a lawyer with the major Washington, DC, firm Baker Hostetler, a former political director for the liberal pro-Israel group J Street, and a former Milwaukee Bucks executive. He’s the nephew of former Wisconsin Sen. Herb Kohl — and, yes, this is the same family behind the Kohl’s department store chain. What’s the story? Wisconsin’s Sixth went for Trump by 17 points. Grothman won the district by nearly 20 points in 2016. Only one Democrat has served this district since World War II — largely because of Lyndon B. Johnson. So this district, covering eastern Wisconsin, will be tough for Democrats, but it’s not out of reach. In 2008, Obama tied here with John McCain. Cook rates it R+8 (which means, all else being equal, it’s about 8 points more Republican than the nation as a whole). And Kohl, perhaps unsurprisingly given his background, has been raising more money than Grothman. Who is the Republican? Rep. Sean Duffy, first elected in 2010. Rep. Sean Duffy (R-WI) and his wife Rachel Campos-Duffy during the House and Senate Republican retreat at the Greenbrier resort in White Sulphur Springs, West Virginia, on February 1, 2018.Tom Williams/CQ Roll CallWho are the Democrats? Margaret Engebretson, an attorney, veteran, and former railroad union worker, is running against Brian Ewert, a doctor at the Marshfield Clinic. What’s the story? Covering much of northern Wisconsin, this district had a longtime Democratic lean until recently. Former Rep. Dave Obey represented the district from the late 1960s until 2010, when he retired. The Seventh voted for Obama in 2008 but flipped to Romney and then heavily to Trump in the following elections. Cook rates it R+8. It’s half rural and half urban, the kind of district Democrats are eying in 2018. Health care has played a major role in this race already, after Duffy voted for the GOP’s deeply unpopular Obamacare repeal-and-replace bill. Who are the Democrats? US Rep. Tim Walz, state Rep. Erin Murphy, and state Attorney General Lori Swanson. Rep. Tim Walz (D-MN) walks through the Capitol on October 25, 2017.Bill Clark/CQ Roll CallWho are the Republicans? Former Gov. Tim Pawlenty (you may remember him from his very short-lived run for president in 2012) and former state Rep. Jeff Johnson, who also ran for governor in 2014 and lost to Dayton. What’s the story? Murphy, a former nurse, is running on a Medicare-for-all platform and picked up an endorsement from the state Democratic Party, though that doesn’t necessarily mean much in Minnesota. Walz and Swanson actually look like the frontrunners: a July NBC News/Marist poll found 28 percent of Minnesota primary voters favored Swanson, 24 percent supported Walz, and 11 percent backed Murphy. Walz represents a more conservative part of the state in Congress and is being forced to reckon with his past stance on guns — one that earned him an A rating from the National Rifle Association. There’s not a lot of new blood on the Republican side, which is shaping up to be a race between a former governor and a former nominee for governor. Pawlenty certainly has more name recognition and cash than Johnson, reflected in his 19-point lead in that NBC News/Marist poll. But his disavowal of President Trump could hurt him with Trump voters in the state. As for the general election? Cook rates this a toss-up, but the NBC poll found Pawlenty trailing all three Democratic contenders. Who are the Democrats? Sen. Tina Smith, the former lieutenant governor whom Dayton appointed to Senate in wake of Al Franken’s resignation after accusations of sexual misconduct, is running again. She’s facing a primary challenge from former Bush administration official Richard Painter, who has been active calling out the Trump administration’s ethics violations — but it doesn’t look like a very competitive race. Sen. Tina Smith (D-MN) walks to a Democratic caucus meeting at the US Capitol on January 19, 2018.Aaron P. Bernstein/Getty ImagesWho are the Republicans? State Sen. Karin Housley faces dental technician and first-time candidate Bob Anderson. What’s the story? Smith and Housley will probably emerge victorious in their respective primaries on Tuesday. For the general election, Cook rates it Likely Democratic. Smith has kept her head down and voted with the Democratic caucus as a freshman senator; she was already popular in the state before being appointed. She has a double-digit lead in a hypothetical matchup with Housley, a recent poll found. Who are the Democrats? US Rep. Keith Ellison (also the current vice chair of the DNC), former Ramsey County Attorney Tom Foley, state Rep. Debra Hilstrom, attorney and former state Supreme Court clerk Matt Pelikan, and former state Commissioner of Commerce Mike Rothman. Rep. Keith Ellison (D-MN) waits for President Trump to deliver his address to a joint session of Congress on February 28, 2017.Bill Clark/CQ Roll CallWho are the Republicans? Former state Rep. Doug Wardlow and former state Sen. Robert Lessard. What’s the story? Ellison, the first Muslim elected to Congress and a progressive firebrand, is easily the most recognizable name in the pack of Democrats running to replace Lori Swanson, who is now running for governor. Ellison has promised to stand up to the Trump administration through the courts. On Sunday, the son of Ellison’s ex-girlfriend wrote a lengthy Facebook post alleging that Ellison had been abusive to the woman. The claims have not been independently verified, and Ellison has denied mistreating her. Hilstrom, the only woman running in the attorney general race, called on Ellison “to answer these allegations” just a few days before the primary. On the Republican side, Wardlow is promising to enforce the “rule of law” in Minnesota. There aren’t many available ratings for this race, but the state has only elected a single Republican attorney general since 1955 ... so it seems safe to say the eventual Democratic candidate is favored to win. Minnesota’s First Congressional District: can Democrats hang on to the seat vacated by Tim Walz? Who are the Democrats? Iraq War veteran and Obama administration official Dan Feehan. Tim Walz, the district’s current representative, is seeking the Democratic nomination for governor. Minnesota First District congressional candidate Dan Feehan works a parade in Waterville on June 10, 2018.Jim Mone/APWho are the Republicans? Former US Treasury Department official Jim Hagedorn and state Sen. Carla Nelson. What’s the story? Walz is well-liked in this relatively conservative region of the state; he was reelected to six terms by running as a moderate Democrat. But now that he’s departing, it’s not a given that Democrats can replicate his success. Feehan has the imprimatur of the Democratic Congressional Campaign Committee. He’s running as moderate — in favor of protecting the Affordable Care Act, the state’s farmers, and the military. Hagedorn and Nelson are both running on conservative platforms and embracing Donald Trump. Walz’s exit is one of the few good opportunities for Republicans anywhere in the country — Cooks rates the district R+5 and a toss-up. Who is the Democrat? Former journalist and hospital executive Angie Craig. She ran for this seat in 2016 (and lost) and has the DCCC’s backing. Who is the Republican? Rep. Jason Lewis, in office since 2017. Rep. Jason Lewis (R-MN) leaves the House Republican Conference meeting in the Capitol on March 20, 2018.Bill Clark/CQ Roll CallWhat’s the story? Lewis, a former right-wing talk radio show host, once complained about how it was no longer politically correct to call women “sluts,” equated LGBTQ people to “rapists” and other criminals, and said that “young single women” who vote to protect their access to birth control didn’t have brains. Craig is an openly LGBTQ candidate and mother who is hoping to draw a contrast with Lewis on social issues and his controversial commentary. She ran against him in 2016 and lost, but Democrats are hoping this year will be a more favorable environment. The district is R+2, and Cook has put it in the toss-up category. Who is the Democrat? Distillery CEO and philanthropist Dean Phillips, who also has the backing of the DCCC. Who is the Republican? Rep. Erik Paulsen, in office since 2009 and a member of the powerful Ways and Means Committee. Rep. Erik Paulsen (R-MN) is reflected in a video monitor in the Longworth House Office Building on November 8, 2017.Bill Clark/CQ Roll CallWhat’s the story? Paulsen was first elected 10 years ago and seems to be pretty popular in his district. He’s a moderate who didn’t support Trump in 2016; he wrote in Marco Rubio instead. But he sticks reliably with House Republicans, casting votes for both Obamacare repeal and GOP tax cuts. Phillips comes from wealth and has made a fortune off his family’s liquor business and gelato company. He has been upfront about this, and vowed to run without self-funding his campaign or accepting PAC money, though he’s still getting plenty of money from various industries. The district should be competitive; Cook rates it D+1, and the Third District went for Hillary Clinton by 10 points in 2016.
Who is the Democrat? Rep. Collin Peterson, in office since 1991 and the ranking member on the Agriculture Committee. From left, Rep. Collin Peterson (D-MN), former Vice President Walter Mondale, and Rep. Rick Nolan (D-MN) attend a fish fry and fundraiser for Nolan at the Northland Arboretum in Baxter, Minnesota, on October 27, 2016.Tom Williams/CQ Roll CallWho are the Republicans? Air Force veteran David Hughes versus National Guard veteran and businessman Matt Prosch. What’s the story? This district is the strange amalgamation: rated R+12 and yet still in the Likely Democratic category by Cook. That’s because Collin Peterson has been in the House for a really, really long time. He was first elected in 1990 and is the longest-serving House member in the Minnesota delegation. Peterson has a record to reflect that; he’s a friend to farmers in a rural district dominated by agriculture and tends to vote more conservative. Hughes already ran against Peterson in 2016 and lost by 5 points. Who are the Democrats? North Branch Mayor Kirsten Kennedy, state Rep. Jason Metsa, former state Rep. Joe Radinovich, former TV news anchor Michelle Lee, and progressive activist Soren Sorensen. Rep. Jason Metsa (D-Eveleth) questions parts of a bill that would extend unemployment benefits to workers on Minnesota’s Iron Range as the 2016 legislative session got underway in St. Paul, Minnesota, on March 8, 2016,Jim Mone/APWho are the Republicans? St. Louis County Commissioner Pete Stauber and Duluth school board member Harry Welty. What’s the story? The Eighth Congressional District also leans conservative. Now that Democratic Rep. Rick Nolan, elected in 2012, is vacating his seat to join the ticket of gubernatorial candidate Lori Swanson, Republicans see a prime opportunity to win back control of a district Cook rates R+4. There’s a large field of Democrats running to be the nominee, and there isn’t a clear frontrunner so far. The state party hasn’t yet endorsed a candidate, although Metsa is leading the race in campaign cash. Stauber, the GOP frontrunner and a well-known local politician, has out-fundraised all his Democratic competitors so far. Who are the Republicans? Incumbent Gov. Phil Scott and small business owner Keith Stern. Scott saw a major dip in his approval ratings after he signed a package of bills that strengthened gun control laws in the state earlier this spring. Stern is running heavily on a platform against wasteful spending in government. Who are the Democrats? There are a few who’ve been generating quite a bit of buzz. Ethan Sonneborn, a 14-year-old high school student who wants to see more young people engaged in politics, is among the contenders. 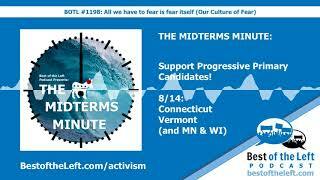 (Vermont has no age requirement for candidates.) Christine Hallquist, a former electric co-op executive, is also on the ballot and could be the first openly transgender person nominated for governor by a major party. Fourteen-year-old Vermont gubernatorial candidate Ethan Sonneborn.Courtesy of Ethan Sonneborn campaignOthers on the docket include Brenda Siegel, an executive director of the Southern Vermont Dance Festival, and James Ehlers, an environmental activist. And in a twist, state Sen. John Rodgers is levying a campaign as a write-in candidate after initially opting not to run. What’s the story? While Scott has been a relatively popular governor for his single term in office, his efforts to strengthen gun control have more recently prompted significant backlash among Vermont constituents. The bills he signed in April, after authorities apprehended a teenager allegedly planning a school shooting in Fair Haven, Vermont, raised the age required for gun purchases to 21, enhanced the scope of background checks, and banned bump stocks, while putting limits on gun magazines. Rodgers, the Democratic write-in candidate, is among those who’ve said he thinks certain provisions of these laws infringe on established constitutional rights. On the Democratic side, a July poll found that Hallquist had the highest name recognition of the plethora of contenders. Despite the blowback Scott has faced, Cook rates the race as Solid Republican. Who are the Republicans? Two business execs — Bob Stefanowski and David Stemerman — had established early leads, but the field has leveled out in recent months. A July poll gave Danbury Mayor Mark Boughton, who also secured the Republican state party endorsement, the edge. Boughton has run for governor before and is leaning into his bipartisan bona fides: He’s currently the Republican leader of a Democratic city. Danbury Mayor Mark Boughton reacts after he is nominated the party’s candidate for governor at the State Republican Convention in Mashantucket, Connecticut, on May 12, 2018.Jessica Hill/APWho are the Democrats? Business leader Ned Lamont, the winner of the Democratic state party endorsement, and Bridgeport Mayor Joe Ganim. Lamont mounted a successful progressive challenge against then-Sen. Joe Lieberman in the state’s 2006 Democratic Senate primary. Lieberman ultimately ran as an independent in the general election, however, and won that race. Lamont also pursued a failed bid for governor in 2010. What’s the story? Current Democratic Gov. Dannel Malloy has opted not to pursue reelection, prompting a large pool of Republicans and Democrats to jump into the race. His dismal approval ratings while the state grapples with a sputtering economy could hurt his party’s chance of holding on to power. While Democratic candidates have dominated statewide offices in Connecticut as well as several recent presidential elections, the state’s governorship has had a tendency to change parties as it moves from an outgoing official to a new one. Cook considers this race a toss-up. Who are the Republicans? Manny Santos, a former mayor of Meriden, has snagged the party endorsement. Business executive Rich DuPont and former college professor Ruby Corby O’Neill are also in the running. Who are the Democrats? Former Simsbury official Mary Glassman earned the state party endorsement in May. Glassman has also previously run for lieutenant governor and is emphasizing her government experience as a selling point. Educator Jahana Hayes is on the ballot too. What’s the story? Rep. Elizabeth Esty is one of few Democrats leaving the House, with retirements less common on the left in 2018. She announced in April that she would not seek reelection after she faced enormous heat for allegedly mishandling accusations of sexual harassment against one of her staffers. Rep. Elizabeth Esty speaks on Capitol Hill.Chip Somodevilla/Getty ImagesThe district — which Clinton won by 4 points in 2016 — is being targeted by Republicans in the wake of Esty’s departure. It’s the most contested of the Connecticut House races this cycle, though Cook still thinks it’s a Solid Democratic district.